So I’ve bought my brace. In this world of globalisation, I bought it online from a US store, and it’s being shipped to me here in Mudgee, Australia. So, hopefully now this will be the first step to healing my knee. Now I have to get these shots into my knee joint, which I’m told cost $500. I guess I can’t buy them on ebay! Will you have to wear it always? Or will it just be worn till the problem heals? the orthopaedic surgeon said I had to wear it if I do any extended walking. But this is the guy that said a knee replacement was inevitable, it was just a matter of when. Orthopaedic Surgeon – of course he’d say knee replacement is inevitable. Surgeon = surgery, the guy went to school to learn how to perform surgery, what else would he say? I think I’ve told you I had ACL reconstruction. Later on I discovered with extensive rehabilitation the surrounding muscles and tendons would have learnt to support the knee keeping it from giving way. That surgery had a 6 month recovery time; probably the same as the extensive rehab would have required. The end result is stability but the cost was 6 months out of work and 6 inch thin scar on the front of me knee because I refused a cadaver ACL. The surgeon harvested 1/3 of my patella tendon along with bone from the shin and patella to form into a new ACL for me. I know you will explore all possible options before agreeing to surgery. Ergh – Arlene, just hearing about your surgery turns my tummy! The knee shots I had cost €100, covered by state health insurance (plus the doctor’s fee, but I’m lucky enough that my generalist is both a specialist in such things and an ex- medical Professor). $500 wow !!! This stuff is incredibly expensive down under !!! hmmmmm about the knee shots, the liquid does need to stay cool (4°-25° C), so getting them from ebay is a no-no. Yes, I’m not sure what the knee shots are exactly, but the surgeon said one a year, and each one is about $500. I’m not going to mess with that! The shots are basically like a lubricating fluid (though my doctor says that this simplistic understanding is actually inaccurate, but I’m not one of his ex-students so don’t really care), though how many shots you get at which time and whether or not they need periodic renewal will actually depend on the peculiarities of each individual person’s condition. They really DO provide relief, and the injections are either a little bit painful or not at all by what appears to be a process of pot luck when the needle is stuck in. They’re hyaluronic acid. Glucosamine is a component of this acid. Thanks for this info Julian. I’ve just finished a short session on the stationary bike. It’s spring here now, and time I got active again. I need to build up the muscles around the knee. I’ll do some stationary bike each day now, gradually building my time. 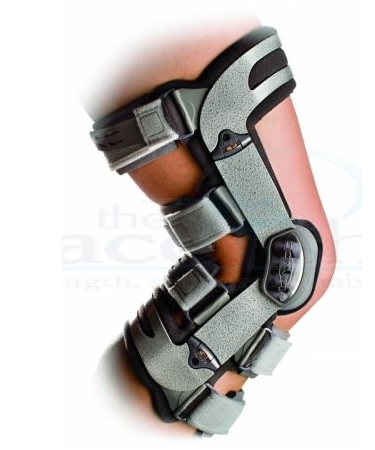 Hopefully this brace will arrive soon, and then I’ll get the injection. There are Caminos I need to walk – I have to get this knee A-OK again! What keeps knees bending smoothly is a layer of synovial fluid between the patella and bony part of the joint. Sometimes it gets infected -I used to get synovitis often, and my knee would swell up like a canteloupe. Then Id have to go to hospital and have it drained. I tried the injections of synovase and a couple of other fake fluids, but my body always absorbed the fluid. Its easy enough to have a painless injection -just ask them to lightly freeze the knee before the big needle comes out. Bill, that’s why you have it frozen first. I like going to the dentist where I have a needle to stop the pain from the other needles! Exactly!! !That’s how I handle the 50 injections twice a week. Julie, I certainly hope so! I miss my daily walks. haha – you’re right Deborah! I’m just glad the other knee is ok!! Hope this works for you on the next Camino, I would hate not being able to hike long distance. I did some work on the stationary bike today, and will start to increase that each day now. I’m looking forward to getting the brace, and getting this damn knee sorted. By the way, it’s great to see you active on the blog.